We're trying to eat healthier here at Casa de Potter, so the Easter Bunny won't be bringing much in the way of sugary sweets. Still, an Easter Basket needs a little something-something to perk it up! 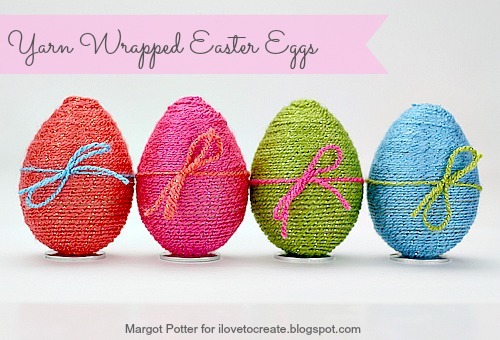 Enter...a basket of pretty yarn wrapped paper mache eggs! 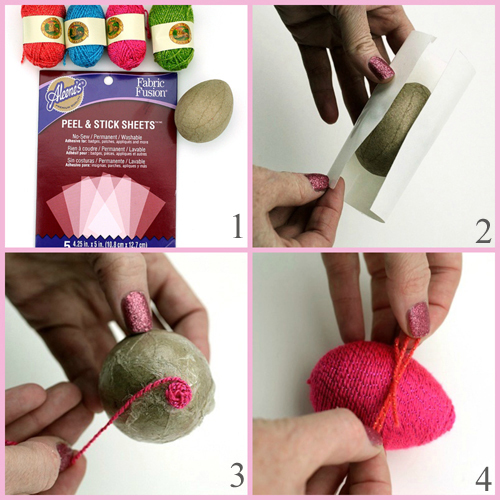 These are so easy to make in three easy steps using Aleene's Fabric Fusion sheets and these sparkly yarn bon-bons were super easy to wrap. I learned this technique from Miss Crafty Chica during our Women's Show classes this summer, it's so much easier than using glue! The key to success is starting at the top, grasping firmly and wrapping tightly. We tried stripes, but found that one color in one continuous thread worked best. We are so happy with how these turned out, we may make some spheres to use for year round decor. 1.) Gather materials. 2. Wrap one sheet around egg. Cut off excess on top and bottom. Gently press sheet to adhere film. Carefully remove. Use the strips you cut off to fill in any gaps. 3. (Egg is sticky, so try to do this in one sitting!) Grasp bottom of egg firmly. Start a coil working from yarn skein. Wrap moving egg and pulling yarn so it remains taut as you wrap. Take your time to prevent gaps between yarn. 4. 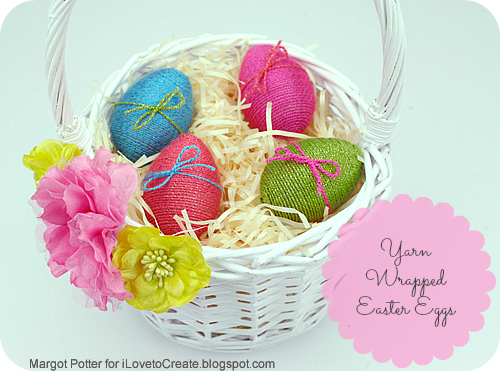 Wrap a contrasting yarn around center of egg and tie into a bow. You could make these with a variety of yarns, twines and fibers, all for a completely different final effect. This is so much fun, you'll be looking for objects to wrap! I hope the Easter Bunny is good to you and yours! Hippity hoppity! beautiful!!!! would love to try these with the kids. thank you.